Add a touch of extravagance to your wedding with a matching collection of stunning invitations, RSVP cards, itineraries and more to set the mood for your special day. Choose from a vast selection of stunning and professionally designed wedding invitation kits for your special day. It doesn’t matter if your wedding is beachy, bohemian, antique or glitzy, we have a selection of professionally designed layouts to suit your wedding’s theme. Sticking to a cohesive design can be pretty tricky for non-designers yet we recognize that not all couples would have the budget to hire a professional designer to create a custom wedding invitation kit. Fret not because you, yes you, can do it yourself with Canva. And there’s no need to worry about compromising on style, because every design element has been perfectly curated or created by a professional graphic designer. With a few drops and drags, you’ll be on your way to an impressive wedding kit in no time. Create a gorgeous wedding invitation kit with just 5 simple steps. Create a new Canva account to get started with your own wedding invitation kit design. Customize your designs to add your own special touch. 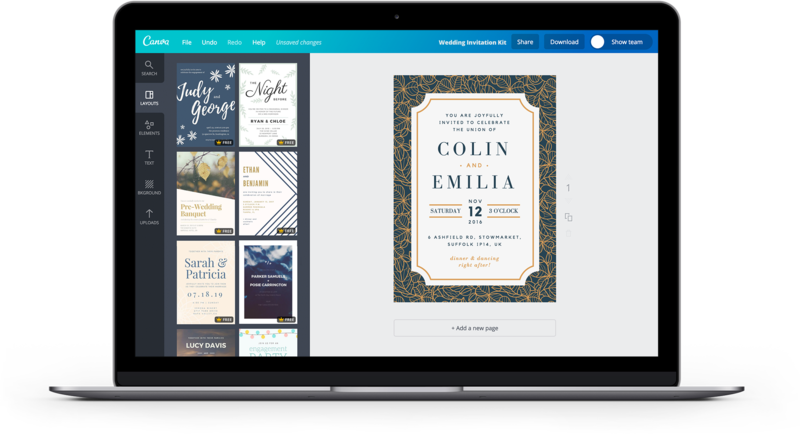 With Canva’s wedding invitation kit maker, you can create a matching and cohesive set of invitations, RSVP cards, Save the Date cards, Wedding Itineraries, Thank You cards, and more to send out to your guests in one convenient design platform. Each layout is designed to be cohesive, simple to customize and easy to use, with everything you need all in one place. You can easily continue your ‘look and feel’ throughout your entire set so there’s no need to worry about mismatched designs; trust us, we’ve got you covered. Is it too good to be true? Well, the only downside is you might have trouble picking a favorite layout to begin with. Why? Because every layout is beautiful. Want to include an image of yourself and the apple of your eye? You can simply upload your photos into Canva to incorporate into your designs. Or go down a different route and choose from our library of over 1 million images, graphics and illustrations. A huge selection of these images and elements are free, but if a premium image tickles your fancy, it will only ever set you back $1 a pop. It doesn’t matter what look you’re after, there is something for every kind of couple. Whether you add a groom-approved graphic or play around with geometric shapes for an arty touch, you’re bound to find something that speaks to your special connection and to you as a couple. If you’re a traditional kind of couple, you’ll want to print your wedding invites out to send to your dearest family and friends. Send your designs straight to Canva Print and we’ll make sure your wedding invitation kit will look as gorgeous on paper as it is on your screen. If you want to share your wedding invitation kit online all you need to do is hit the ‘share’ button. This gives you a variety of sharing options, like allowing you to post your designs straight to social media and even generating a custom URL to share with whomever you choose. When it comes to creating varying but consistently-themed designs, Magic Resize has got to be one of our favorite features. Available for Canva for Work users, Magic Resize allows you to take a template or finished design and seamlessly adapt it to a different set of measurements. So, if you want to create posters, social media posts or more cards for your upcoming nuptials, you won’t need to remake the same design over and over. To Magic Resize your design, make sure you’re using a Canva for Work account, open the design you wish to resize, click on the File menu, select Magic Resize and tick the checkboxes next to the design or document types you wish to resize your design to. Once you’re done, click on the Abracadabra-Resize button and voila! You’ve just transformed one design into several others in just a few clicks! There’s no need to download or install anything to use Canva on the web. Simply head over to www.canva.com and create an account online to get started. Alternatively, you can download Canva on your iOS and Android devices, allowing you to create designs at home, at work or on the go! How much does it cost to create a wedding invitation kit in Canva? Designing Wedding Invitation Kits in Canva is free! Our library of wedding templates, from Save the Date Cards to Invitations, Itineraries and Thank You Cards has been created by awesome designers, making it as simple for you as a few clicks to create a professional design. If you use your own images in your design, the entire process will be free.